Sunday WiP - monemades Webseite! It has been once again a busy week, not the least since a leaking facett caused quite a mess in our bathroom and most of my leisure time was spent cleaning up and doing some repair work. 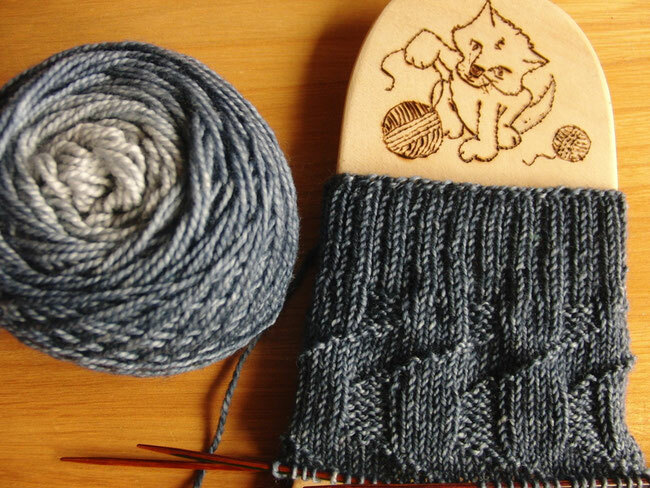 Anyhow, today is Sunday, so finally some time for my knitting. I picked up a long neglected WiP, a pair of socks in a gradient yarn by White Birch Fiber Arts I bought in the States last year. So, so beautiful - I just love the slowly changing colours. Yes, it's hard to tell on this pic (of sock number two), but you'll see it once the pair is done. I only wish I had bought more than just this one set for a pair of socks. Sigh. The socks are for another special internet friend I had the chance to meet last year. The pattern, which is almost ready for tech editing, will be my next contribution to my (No longer virtual) Friends collection and will also be available for individual download. Soon, I hope.